I travelled to Zürich for the weekend. A friend moved there from Canada for an internship, and I met her at the airport to help her as she settled in. The idea was that my crappy German would serve better than her total lack of German. Plus, having been a brand new immigrant myself only two years ago, I’d relate to some of the challenges faced in those first few days. A friendly volunteer from the internship program named Eivind met us at the airport and led us to Sara’s new place. I offered dinner on me, so we dropped off her bags and headed out for — what else — beer and fondue. Everyone warns that Switzerland is expensive, so let’s talk exchange rates for a moment. As a rough guide, the Swiss Franc is about on par with the Canadian Dollar, so every time I say Fr. (CHF) convert it in your mind to CAD. For European readers, one Swiss franc is, loosely, half a pound, or 66 eurocents. Like Germany (and the UK and, well, every civilized county outside of the Americas) sales tax is included, therefore the price I quote (plus a minimal tip when applicable) is the price you pay. So, onward to the tasty details. I hear skiing is popular as well. We did not have fondue in mind when we wandered into the most conveniently located sitdown restaurant, but even at Fr. 23.- per person, it seemed compulsory as a first meal. I declared with my usual self assurance that at that price it was bound to be more than just cheese and bread. I was right: our bubbling pot of dairy gold and basket of bread cubes also came a few boiled potatoes each. I pre-emptively craved green vegetables even before we started eating. Not without incident, we ate square after square of dripping bread and discovered the sweet, tender garlic cloves that had been stewing under all that cheese. Glorious. Worth every penny. I hardly even minded that our half litre glasses of beer were Fr. 9.- each, which is the typically outrageous price for beer in Zürich. Sadly, they were out of White Chocolate Blueberry, a favourite at the office. At Migros, I laughed out loud at the price of meat. It was not just that Fr. 37.- for a 750g roast was shocking. This price was not seen on a premium cut in the butcher’s case; this was a sale price on a poster near the door. What made me laugh was that Fr. 25.- per pound was clearly a deal. Maybe all meat in Switzerland is locally raised and environmentally responsible. More likely, the growers and the food are simply not subsidised. It made me realise what the real price of meat should be. We found good prices on vegetables in a Turkish market next door. No surprise there. After a day of shopping and Swiss bureaucracy (which is markedly speedier and friendlier than German bureaucracy) Sara went to bed early and I went into the city centre on my own. It was then that I learned that day passes in Zürich are the price of two regular tickets and are good for 24 hours. For Fr. 8.- it seemed a very good deal. I hopped off the number 7 tram at the Central stop, and was drawn to the gleam of a wet cobblestone passage that curved slightly uphill past the well-lit Starbucks. Though all the shops of what turned out to be Niederdorf Strasse were closed or closing (at barely past 9pm on a Friday night) a lot of the display windows were lit up, and their contents glittered like jewels. Antique books with titles like Das tägliche Leben. Stationary available with custom binding with your choice linen and lettering. Green, yellow and brown leather bags. Men’s scarves that made me swoon. 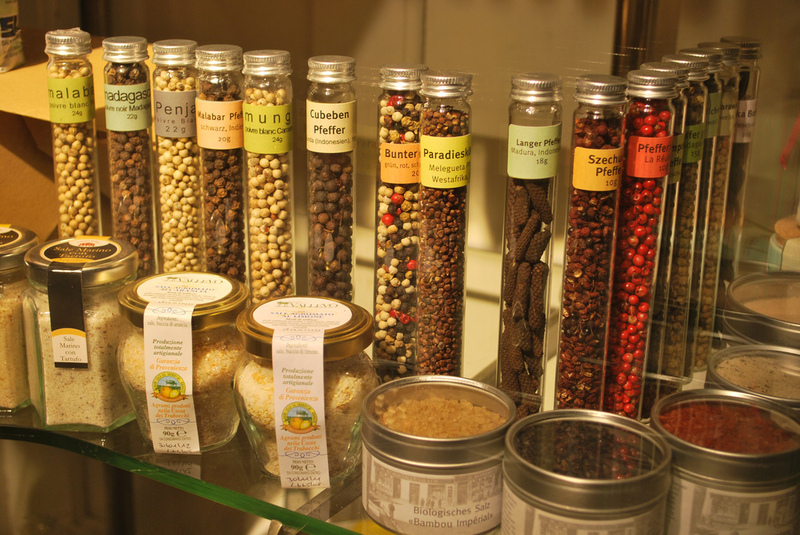 But oh my the best of all was a shop that sold every manner of pantry delicacy conceivable. Nuts displayed in candy dishes. Exotic flours and grains. Multitudes of peppercorns. Vials of vanilla bean. Oh the candied and dried fruits. Jams. Chutneys. Mustards in clay pots. Loose tea. Fresh roasted coffee. I felt like a child in front of a Christmas display. It was almost embarrassing. I returned the next day of course but limited myself to a box of crackers and a gift for Kristin. It snowed unrepentantly the entire time I was there. 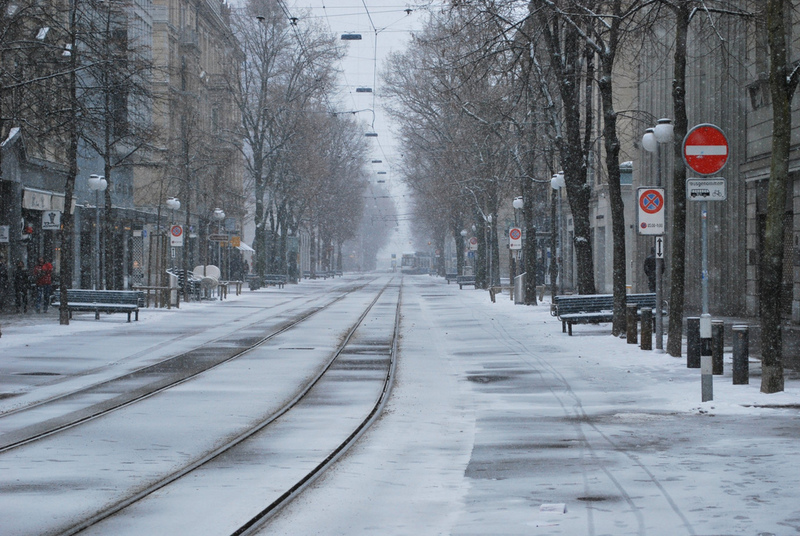 The fluffy snowflakes were beautiful against the tasteful while luxurious local architecture. I suspect I would have traded snowglobe-style white-out conditions for a view of the Alps, but that was not an option. My impression of Zürich was that it’s a hilly place with fine things that cost a pretty penny. My advice: have the fondue, then raid the grocery store and eat in if you can arrange it. 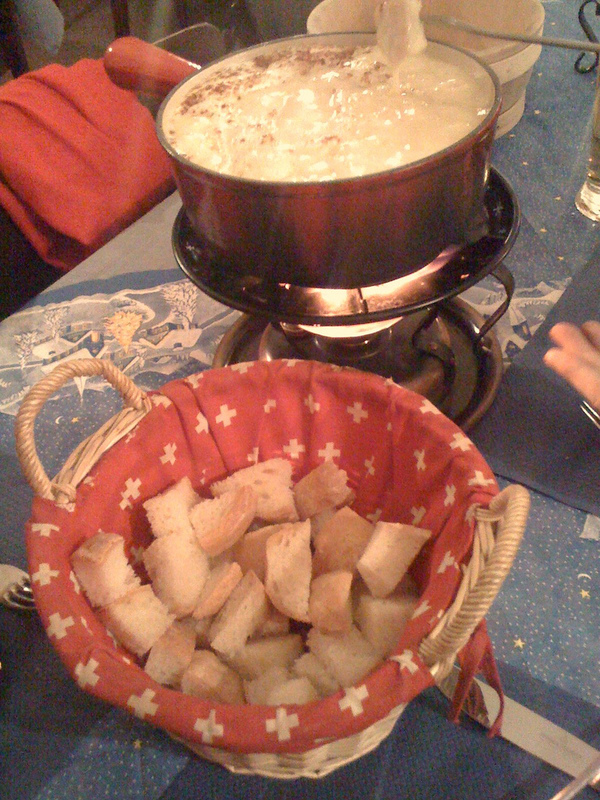 In fact, assuming you aren’t jetlagged and disoriented, have the fondue in as well. Several pre-made fondue options are sold in the dairy aisle. The money you save on beer will pay for a serviceable fondue set, which are also available in any grocery store. a conservative portion of food at a self-serve vegetarian buffet called Hiltl that charges by weight: Fr. 19.50 (Sara’s was somehow Fr. 27.-) but tap water and awkward live music were included free. I should add: the food there was delicious. 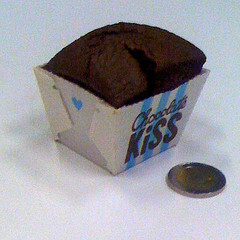 a tiny chocolate cake at the airport: Fr. 3.90, but hey it’s the airport and I was using up my francs. I am now seriously considering the logistics of tiny cake baking. Specifically, is it possible to make just one or two at a time? For rich fudgy cakes, could the extra egg be used for half batches of mayonnaise or a wee omelette or a bite-sized quiche? Is there a market for a cookbook that has recipes that use less than one egg, and if so does anyone know a publisher or literary agent I can speak with? I think I have a few postcards from Hiltl floating around somewhere. Yum. The food, not the postcards. Tiffany if you write a book on tiny baking I will buy it. And help test recipes. And Chris will thank you. Sometimes when I bake I won’t let him come to bed until he’s eaten at least two slices. It can take a long time for one thin man to eat an entire cake…. Oh, except I will need to buy a couple dates, which are key, and which I am out of. Last December, I made a delicious appetizer of lemon marinated anchovies sandwiched in sage leaves and fried in a batter (recipe courtesy of Jamie Oliver, and truly fantastic.) The batter used one egg, but all my little sandwiches made hardly a dent in it due to the foaming qualities of carbonated water. I should have tried egg fractions to cut a little of the waste, especially since dessert was creme brulee.